Ryogen-In is one of the sub-temples of Daitoku-Ji (大徳寺), and it was founded in 1502. There are 5 gardens in this temple. 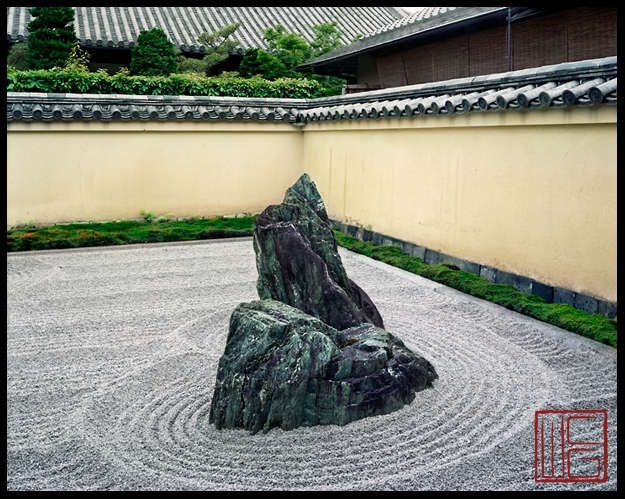 This image captures a part of “Isshi dan / 一枝坦”, a Zen garden known as “kare san sui (枯山水)”. The concept of Kare San Sui is very unique. The white stones/pebbles/sands represents the area of water, and the rocks may represent the islands in the midst of the great water-sea. Though not as entertaining as the colorful gardens, this type of gardens enable us to meditate upon and contemplate about the deeper aspect/meaning of nature/universe.